After throwing out the question "Which would you prefer?" in that painfully short post I made last month, I was pleasantly surprised that the majority of commenters loved the dumplings. I grew up eating xiao long bao for breakfast almost every morning when I lived in Shanghai. I think it's one of those things you absolutely must eat in your lifetime; you'd be hard-pressed to find a more perfect morsel of food. Of course, I may be biased since they are my favorite food item but if you've seen the No Reservations: Shanghai episode, I'm sure Anthony Bourdain would agree with me (even though he hates food bloggers or something like that). Hopefully no one falls asleep reading this thesis-length post--I swear I tried to edit out as much as I could. Both xlb and croissants, which will come a little later, were in the top 5 of that huge long list of things I wanted to make this summer. I was able to cook about 1/3 of the list even though I only blogged about a handful of them. As for the rest of the items, the time frame is extended... indefinitely? Gotta love personal deadlines. 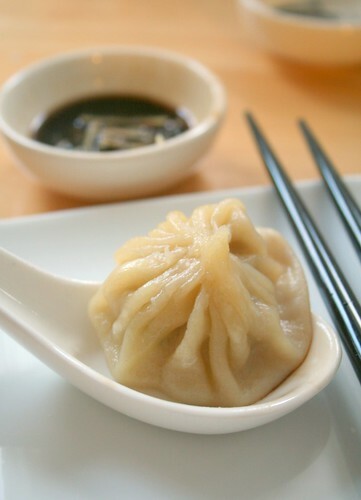 The xiao long bao, also called soup dumpling, is a bite-sized dumpling in a thin flour wrapper with a pork, sometimes crab, filling and a rich broth. The soup is what sets the xiao long bao, its pan-fried cousin the sheng jian bao, and the larger relative the tang bao, apart from all other dumplings and buns. The trick to getting the soup inside the dumpling is make a gelatin rich soup that solidifies at room temperature (think meat soup Jello) then mash it up into small chunks and mix it with a ground pork filling. As the buns steam, the pieces of gelatin soup in the filling melts back into a liquid that's now magically encased in the delicate wrapper. Pretty cool huh? A well made xiao long bao will have nearly two dozen pleats in the thin, almost translucent wrapper, a tender meaty filling, and is bursting with savory soup. Xiao long bao originated in Shanghai over a hundred years ago and have now become an iconic symbol of Shanghainese cuisine. They were created by the Nanxiang Steamed Bun Restaurant, which still sells these dumplings to this day. In Shanghai, you don’t have to travel far to find this morning staple but here in North America, there are only 3 major metropolitan areas that I know of serving this niche food item. Unfortunately, here in Seattle, you won’t be able to find any that are worthwhile. Instead, you'll have to make the drive up to the Vancouver/Richmond BC area, which has half a dozen or so restaurants serving decent xiao long bao (my favorite location being Shanghai River in Richmond). For elsewhere in the US, I've heard good things about the xiao long bao you can find in Southern California and New York City. Outside of Vancouver, SoCal, and NYC, I’m afraid you might be out of luck but if anyone finds a good city in the States do let us know! You may be tempted to buy the frozen xiao long bao sold at Asian grocery stores but usually they’re utterly disappointing-the skin is too thick, the soup leaks, and the filling is tough and studded with overwhelming chunks of ginger. But when a craving gets really, really, really bad, I'm not gonna say no. When faced with a fresh basket of soup dumplings, don’t stick the whole thing in your mouth and chomp down. Hot juices will spurt out, dribble on your shirt, and worst of all, scald the inside of your mouth. Instead, after dipping the dumpling in a little black vinegar, place it on your spoon and gently nibble the wrapper and slowly slurp up the soup so you don't burn your tongue. Then dip the dumpling again in the black vinegar if you like a more vinegary kick before eating it. Some places will give you some ginger slivers to add to your black vinegar. If you really want to try making this at home, I have to warn you that it’s long and time consuming. It was the most tedious recipe I have ever attempted but I'm weird and I like spending my weekend cooking something that takes 2 days to prepare. Even though the majority of my dumplings look misshapen and half of them leaked, the flavor was spot on! I did a pretty good job for a first attempt but I won't be making these again for years... So next time we'll just drive up to Vancouver for our fix. If you're still set on making these at home, I implore you, please don't take short cuts. Don't make the stock with that can of Swanson's sitting in the pantry from 2001 *blech*. What makes these little gems special is the flavorful soup inside so spend the time to make a good soup base. It's worth it! While you could take some homemade chicken stock set it with gelatin, it will lack the velvety, almost creamy richness of a traditional slow simmered stock made collagen-rich pork feet or pork skin. For my stock, I used a combination of chicken wings, chicken backbone, and some pig feet along with aromatics like ginger, green onion, and star anise. You can use pork skin too but the meat in the pig feet will adds to the flavor. Make the wrappers fresh too because if you spend all that time making the soup and filling, it's a shame to use storebought wrappers. Add 2 teaspoons of oil to your pot over medium heat. Smash the ginger slices and green onion with the side of a knife and add to the oil and until they are fragrant, then add boiled and rinsed off chicken wings and pork feet, 1 star anise, and 8 cups of cold water. Bring to a boil then simmer gently uncovered, skim any scum on the surface, for 6+ hours. Never let the soup boil again because it will cloud. The stock is ready when it can solidify at room temperature. Test the stocks gelling ability by spooning some of it into a small bowl and allow it to cool down to room temperature. If it solidifies then the stock is ready. Strain soup and season it with some salt. Set aside 2 cups for the dumpling filling. Save any excess for adding to sauces or soups. Let the soup cool to room temp then transfer it to the fridge. The soup can keep for up to 3 days in the fridge. You can scrape off any fat that solidifies on top or mix it into the filling, up to you. In a large bowl, add 2 1/2 cups of flour. First add the 1/3 cup of very hot water and stir that into the flour. Then add the 2/3 cup of cold water and stir it into the dough. Bring the dough together and knead while incorporating additional flour if you need to, until the dough is not sticky. Don’t overknead or it will be too tough and gluteny to work with. Cover the dough with plastic wrap and let it rest for an hour while you prepare the filling. Mix the ground pork with all of the seasoning ingredients. Roughly chop the aspic then use a pastry blender or two forks to mash it into smaller pieces. Mix this into the ground pork mixture. Keep it in the fridge until the dough has finished resting. Divide the dough into 3 portions. Work with one portion and keep the other two covered. Roll the dough into a long snake. Then cut a small cylindrical piece off of the snake. Flatten with your palm and roll the dough out into a 2 1/2 inch diameter wrapper. The best rolling device for making Chinese wrappers is a small wooden dowel thats about 6 inches long and 3/4 inch in diameter. The first 4 pictures in the eating Chinese xiao long bao tutorial shows the process of making the dough and wrappers. You want the wrappers to be a bit thicker than wonton wrappers. If the wrappers are too thin, the soup will dissolve it and leak out. Place about 2 teaspoons of filling in the center of the wrapper. Hold the outer edge of the wrapper with the thumb and index finger of your dominant hand. Using the other thumb and index finger, hold the edge of the wrapper and bring it to your dominant hand to pleat. Pleat around the circumference of the entire wrapper, turning the dumpling as you go, and seal the tip to close. The third and fourth pictures in the third row of the eating Chinese xiao long bao tutorial gives a somewhat helpful guide. The hardest part for me was getting my thumb out of the inside of the dumpling and sealing the tip. Serve hot with ginger slivers and black vinegar. omg- they LOOK SO PERFECT! wonderful job! Wow! This looks incredible! I've never had xiao long bao, now I'll be on the lookout. I probably won't try making them at home though! Zowie! As much as I like to eat these, I don't think I could ever do these. Yours look fantastic. Wow, you are a "purist" in xiao long bao... I'm glad I could read the chinese on the xiao long bao tutorial - that's so cool. Now I just need to block out 2 days to try it out. Maybe make a huge batch and freeze the lot. I would love to make these sometime just for the cute factor. They're darling little bites! I have been obsessing about this ever since I saw it on Joycelyn's Kuidaore blog. I have never tate Xiao long bao but just the thought of it makes me drool! these look gorgeous! I am amazed. Love these, but am not sure I'd dare cook them—quite a lot of effort! I had xiao long bao for the first time about a month ago and thought they were made of magic. Turns out I wasn't too far off. Thanks for such a detailed post! And, for what it's worth, there is at least one restaurant that serves decent xiao long bao in San Francisco: Shanghai Dumpling King. Granted, while I thought they were delicious, that was the first and only time I've ever had them so my opinion probably doesn't carry much weight. But my friend who has traveled extensively in China seemed similarly impressed. You really outdid yourself! I bow in deference to anyone who makes these in their home kitchen. You have a convert here. These really are incredible looking. Good job. Where did you get the time? Your dumplings are perfect! They are so cute!! Thanks for the recipe! I am so impressed that you made everything from scratch! Really? No where in Seattle are there any good xiao long bao? That is so sad. I will look around and if I find them I will let you know. If not, then I will try making these. yum! That looks absolutely beautiful and delicious. I discovered your blog about two months ago and have been following it - great blog and recipes. Good luck in med school, and oh god I WANT A XIAO LONG BAO! They were a childhood favorite of mine as well, but haven't had any worth mentioning since I moved to the U.S. I saw a write-up recently of a restaurant called Zhi-Wei-Guan in Philadelphia that is supposed to have good xiao long bao - but I haven't tried them yet. Nevertheless, I am totally making these at home - thanks for the recipe. Nicely done. I would love to learn how to make these. I just saw your post on SA, I never knew you were a goon! Good luck with your studies. These look so perfect, and I love the step-by-step directions you found, very useful! I can't believe how perfect your pleats were! They look delicious! Anyone in NY should try Joe Shanghai's (both in Chinatown and Flushing). They have great crab meat xiao long bao. Oh my gosh. I have been looking for a recipe since I ate at Joe's Shanghai in Manhattan where they are famous. Looks labor intensive, but maybe when I have a long weekend I'll attempt it! Thanks for the tips! And Seattle represent! I just graduated from UW and am planning to go to grad school there also, so go Huskies! they look perfect! absolutely incredible! My wife and I have always been big fans of Asian food. We were fortunate enough to be able to spend a month in China a couple of years ago. Ever since I have been on a hunt for better and better Asian recipes. The thing that I have had to accept is that my dumplings don't always look as pretty as the professionals . . . but they still taste wonderful. I can't wait to try these Xiao Long Bao. Those look so inviting! I made them too, without the anise. Such a good idea! Seems like it would be that special something in the back of your mouth that makes you wonder! Thanks for such a complete recipe and background, I am inspired now to take the challenge and try to make them. Xiao Long Bao lovers in the San Francisco Bay Area should check out Shanghai Dumpling Shop in Millbrae. Its our favorite, as good as the ones we've had in Shanghai. China Stix in Santa Clara CA also serves a good version of them but I believe they're an off menu item, just ask. If you're living in Texas, like we are now, Shanghai 2000 restraunt in Austin serves a decent version. I wanted to add in Palo Alto, CA, Su Hong's makes a very good Xiao Long Bao. Just make sure it's the Palo Alto restaurant and not the Menlo Park one. Thanks for the recipe! One of my favorite foods. And Gourmet Dumpling House on Beach St in Boston's Chinatown serves fantastic xiaolongbao, by the way! Ed's Potsticker House in Chicago has great xiao long bao for all those on the third coast. I know this is an old post but I just happened upon it thanks to pinterest and wanted to let you know that if you are ever in Atlanta you can get delicious soup dumplings at Chef Liu in Doraville.